Openshift V3 offers a simple solution to call external services. This solution lacks some possibilities like use DNS names or use more then one destination. The here described solution offers you the flexibility of haproxy with logs for this service. Here the picture for the solution. You can use the official image on docker hub of haproxy I suggest to use the alpine one. I have used this repo for a proxy to Google. 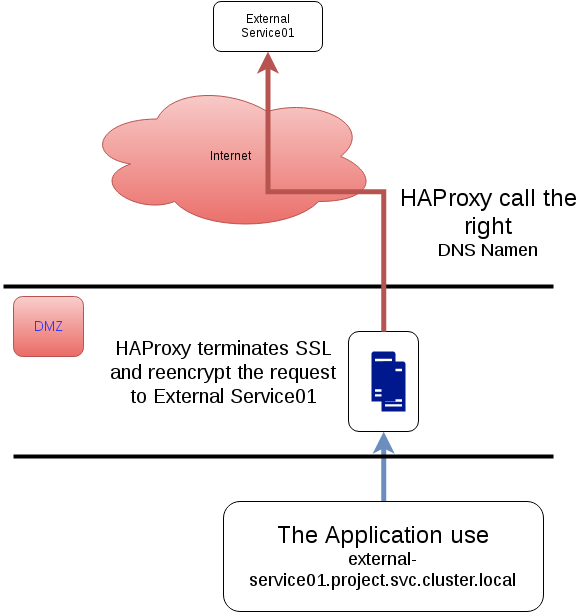 Now you should take a look into the excellence documentation of haproxy. Q: Why do I use a file for the creation not directly? then to search for all components ;-). Don’t use the user/uid and group/gid on openshift! Dont’t use daemon option in openshift! After some times you will see the pods up and running and in the log of socklog pod you will see the log-entries of haproxy. 10.1.3.1: local0.notice: Apr 27 18:29:18 haproxy: Proxy entry-point started. 10.1.3.1: local0.notice: Apr 27 18:29:18 haproxy: Proxy google started. To be able to use this service now add a route. When everything works as expect you should see something like this. 10.1.5.1: local0.notice: Apr 27 19:56:25 haproxy: Proxy entry-point started. 10.1.5.1: local0.notice: Apr 27 19:56:25 haproxy: Proxy be_google started. 10.1.5.1: local0.info: Apr 27 19:56:55 haproxy: 10.1.2.1:41173 [27/Apr/2016:19:56:55.189] entry-point be_google/srv_google/216.58.212.132 0/0/111/18/129 404 1686 - - ---- 1/1/0/1/0 0/0 "GET / HTTP/1.1"
10.1.5.1: local0.info: Apr 27 19:57:21 haproxy: 10.1.2.1:41427 [27/Apr/2016:19:57:21.555] entry-point be_google/srv_google/216.58.212.132 0/0/42/18/60 404 1686 - - ---- 1/1/0/1/0 0/0 "GET / HTTP/1.1"
You can hire me to create that for you. This entry was posted in DevOps, haproxy, Misc, openshift.